Building deconstruction, also referred to as "green demolition," is the careful dismantling of a home or building in order to salvage any reusable materials. This significantly reduces the amount of materials going into our landfills and clogging up our environment. The EPA estimates that roughly 250,000 homes are demolished in the U.S. each year, adding up to approximately 124,670,000 tons of construction and demolition debris (C&D). If even a portion of those homes were deconstructed, thousands of tons of waste would be diverted from landfills each year. That means big, positive changes for our environment and future generations. Keep reading to learn more about how deconstruction can not only help save the environment, but save you money, too! Our guide will walk you through step-by-step. Step 1: Find a reputable deconstruction contractor in your area. It shouldn't be hard to find a number of contractors, companies, and organizations that offer deconstruction services. Habitat for Humanity offers exceptional deconstruction programs to cities across the country. Not only do they typically cost less than contractors, but by choosing them, you're also supporting affordable homeownership in your community. For more options, visit IRS's Exempt Organizations Select Check site to find other groups that are eligible to receive tax breaks for charitable donations. Step 2: Arrange for an appraisal consultation. If you predict salvaging more than $5,000 worth of materials, make an appointment to have the IRS-approved contractor or company of your choosing come to your home for a consultation. They will perform a quick inspection of your property and give you an initial quote for the value of your home. Learn more about what makes an appraisal or appraiser "qualified"
This is a good time to seriously consider the pros and cons of whole-house deconstruction vs. selective deconstruction. Talk with the professional(s) of your choosing to get their opinion on whether or not it would be a good fit for the amount of usable materials in your home. Step 3: Obtain and file the necessary paperwork. Before deconstruction can begin, more often than not, you'll need a permit (as well as proof that all utilities have been shut off properly). Most deconstruction permits require either a minimum amount of materials be diverted away from the landfill or an indication of what and how much will be salvaged, which is where the qualified appraisal comes in. Also, if there's asbestos in your home, additional permits will be required. Be sure to check with your local building department, or ask your company/contractor, to ensure you comply with all necessary regulations. Don't forget to get the necessary tax forms from the charitable organization(s) you choose. Form 8283 is the most common of these forms—be sure to follow instructions. Step 4: The contractor will carefully deconstruct the house. Depending on your particular home and the amount of salvageable materials you have, the deconstruction process can take anywhere from a day or two to a week or more. You'd be surprised how many materials in your home are considered usable, even after years of wear and tear. The chart below gives examples of the most commonly salvaged materials and what to do with them. 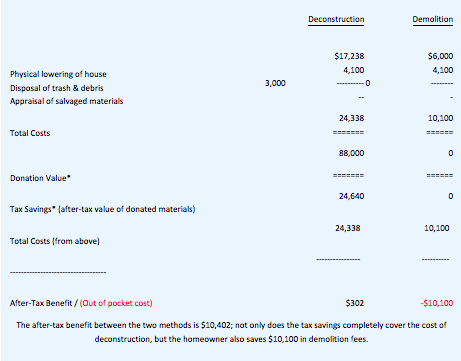 Be sure to follow these material donation guidelines to ensure you get the most tax deductions possible. NOTE: If you're doing the deconstruction yourself, this in-depth outline does a great job of highlighting all the risks and precautions to take when deconstructing, along with timelines, organization and safety planning, and more. According to the CDRA, in 2012, roughly 480 million tons of C&D were generated in the U.S. It was projected that more than 70% of that was recycled and reused by the C&D recycling industry. Be a part of the green demolition movement! Save the environment and ultimately some money by deconstructing your home or building. Want to see more? Check out the video below from the Wall Street Journal highlighting the rise of deconstruction on the West Coast.